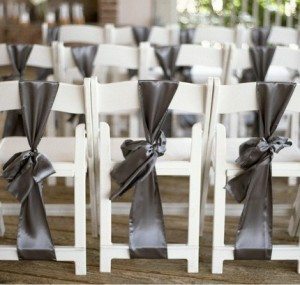 To be honest, I NEVER recommend chair sashes to my clients. I find them so...weddingy. Does that sound strange? 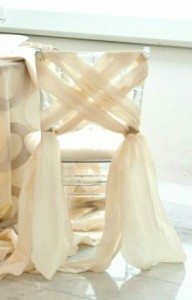 The satin and organza sashes tied in a bow conjure up some scary images for me. I prefer a far more modern or unique way of decorating a chair. Chair bands- yes, ribbons- oh yes, flowers- absolutely! 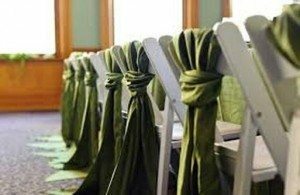 Chair sash- I'd rather not.How-ever, I recognise that many venues and hotels offer chair sashes as part of their decor free of charge and for the budget conscious bride this is sometimes just too good of an offer not to take up. 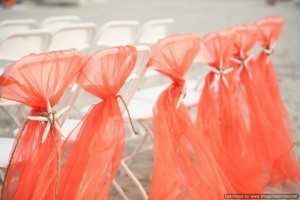 So if you are doing this or have bought someone else's wedding sashes off Trade-Me then look at a different way of presenting them.